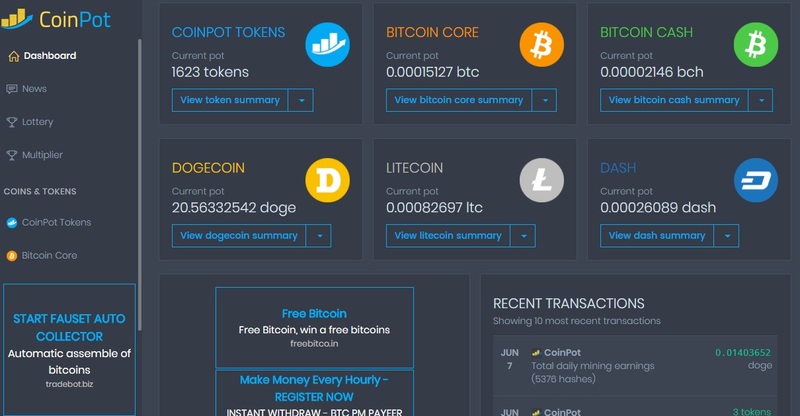 This entry is a continuation of other entries where I discussed several faucets that are all connected to Coinpot micro wallet where you can earn free bitcoins online. 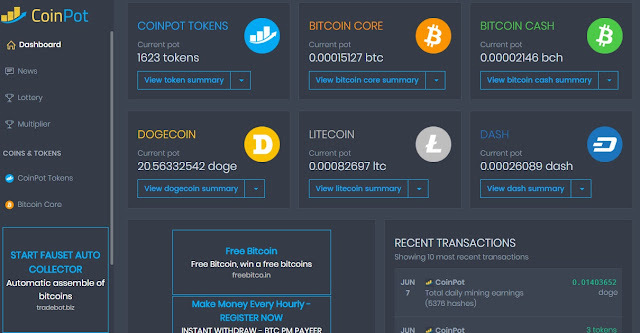 In this post, I will like to show you how much you can make from Coinpot in a year. Of course, you’ll want to know how much you can make before investing the time. Wouldn’t you? How much you can make depends on a number of factors. Based on my model as I will reveal shortly, you can make as little as $900 in one year or as much as $2 million in 1 year. 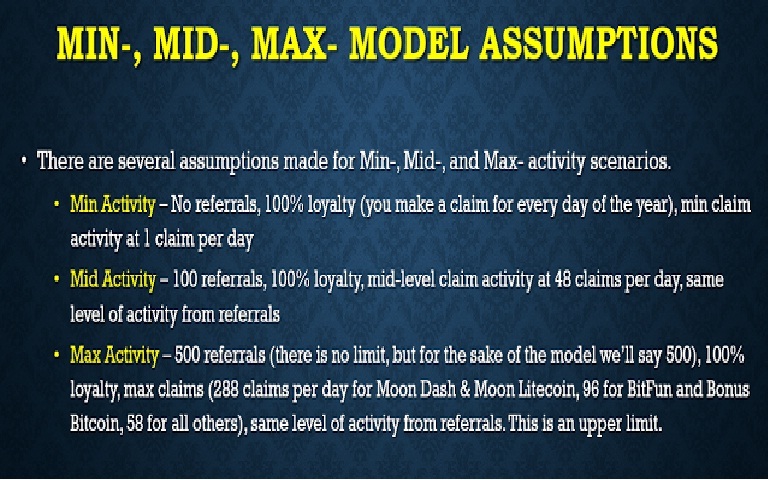 It depends on several factors including the original claim amount per time, the number of times you claim a day, the number of referrals you have, the number of times your referrals claim a day, the loyalty days, i.e. how loyal you are to making a claim every day, and a number of other factors, and lastly the prevailing exchange rate at a particular time. I have created a calculator to figure it all out as you’ll learn shortly. Within the calculator, I’ve created scenarios that help to understand how the different factors above can impact your daily claim amount. These scenarios are labelled min, mid and max. The min scenario represents the person who puts forth the least amount of effort. The max scenario models out the power user with the highest amount of activity. The mid scenario is somewhere in between. In other words, Min activity is for someone that just make maybe only one claim in a day and has little or no referrals under him. Mid activity is someone with 100 referrals making between 25 and 48 claims a day, and Max activity is the super-worker who’s maximizing his time to make every claim possible. I like the think of Min. as a lower limit, Max as an upper limit and Mid as an average. Next, I annualized the daily claim amount from each faucet calculator under each scenario, made a forecast of cryptocurrencies one year from today and the results are analyzed below. The first set of results provides an estimate of how much you can make if crypto prices remain the same as they are at the time of writing this ebook. As you can see from the boxes highlighted in yellow, the minimum amount you can make in a year is around $900, the middle point is around $10K and the max is almost $70K. If you’re just making 1 claim a day for the rest of the year and have no referrals, you can make $900, providing prices remain the same. 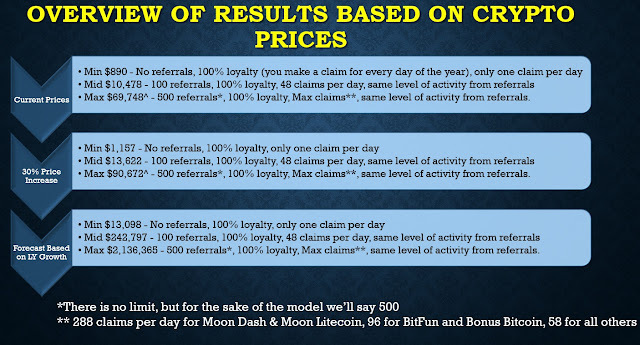 If you make 24–48 claims per day with 100 referrals doing the same thing, you can make $10K, providing prices remain the same. If you make maximum claims per day for example, like 58–288 with 500 referrals doing the same thing, you can make $70K, providing prices remain the same. The thing about crypto is that the price does not stay the same. As much as I like free money I wouldn’t be advising you to do this for $900 a year — though that’s nothing to sneeze at, especially if it’s free. Early investors of Bitcoin paid just $0.06 for a Bitcoin. A $100 investment seven years ago would be worth $28 million today. It is highly unlikely that crypto prices in one year will be what they are at the time of writing this article. What if crypto prices grew 30% on average? The following chart shows what happens to the value of your crypto holdings if crypto prices at the end of 2018 are 30% higher than they are at the time of writing this. If you’re just making 1 claim a day for the rest of the year and have no referrals, you can make $1,100 with a 30% increase in prices. If you make 24–48 claims per day with 100 referrals doing the same thing, you can make ~$13K with a 30% increase in prices. If you make maximum claims per day like 58–288 with 500 referrals doing the same thing, you can make ~$90K with a 30% increase in prices. This is amazing, but again, I wouldn’t be telling you to do this for $1,100. The reason people are interested in cryptos, the reason why people are taking out a mortgage on their home to invest in cryptocurrency is that of the exponential growth rates. Bitcoin, Dash, Litecoin and Dogecoin all grew by 1326%, 5935%, 5215% and 3916%, respectively, over the last year (Bitcoin Cash just started in late July/early Aug.). This is amazing growth and there’s a chance it won’t ever happen again, but cryptos have been on a growth trend for the past five years so I don’t think last year was a fluke. Here’s a chart showing the pace of growth in the crypto market over the last 5 years. If you’re just making 1 claim a day for the rest of the year and have no referrals, you can make $13K if prices grow the same rate as they did last year. If you make 24–48 claims per day with 100 referrals doing the same, you can make ~$240K if prices grow the same rate as they did last year. If you make maximum claims per day (58–288) with 500 referrals doing the same thing, you can make ~$2 million if prices grow the same rate as they did last year. Note: there is no maximum number of referrals you can have so this could be higher. Cryptos may not be able to keep up the bull run they had last year, but if they do it means you could be sitting on a nice portfolio of crypto by the end of the year without spending a dime. Here’s a quick overview slide of all three price scenarios. The amount you make depends on the level of activity of you and your referrals. No matter what the scenario, in terms of activity level or price, Coinpot is a great way to invest in cryptocurrency without incurring any risk. It’s also great for people that are new to the cryptocurrency world. You don’t have to buy anything or set anything up. It’s all been done for you and it’s all free. All you need is a computer, internet connection and an email address. To be clear, not all faucets are like Coinpot, so be careful. The reason I prefer Coinpot is due to its ease of use and credibility. I’m currently working on a few other wallets/faucets and will write a guide about them shortly. Sign up with all these faucets using the same email address you used for Coinpot and start making money by claiming free bitcoins units. There's no limit to how much you can make, it all depends on your effort.